When it comes to drinking wine out of the appropriate glass there are several schools of thought on the subject. Many believe that the glass doesn’t make a terrible amount of difference to the wine tasting experience and when you do use a higher quality glass, it’s really just the perception of having the wine taste better. Still others believe that the wine glass itself can make or break the wine. It’s safe to say we are somewhere between the two extremes. It’s not always fail proof as corked wine sipped from a Riedel glass, will still be corked wine. We do believe that using the right glass definitely improves how much we enjoy the wine, though. The care and craft that artisan glass makers put into each glass really shows through when you’re tasting wine. When it comes to varietal specific tasting glasses, Riedel is more than likely the name you’re most familiar with. They make glasses for almost every sort of wine ranging from traditional Old World Red Bordeaux to New World style Pinot Noir. They even have taken on the iconic Coca-Cola and have made a glass specific for that soda. 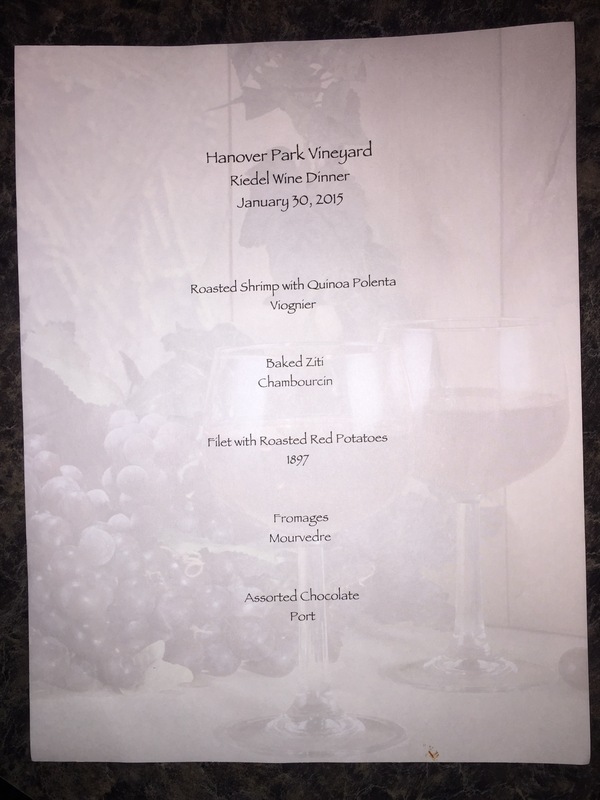 This post won’t get into much of the specifics about each individual class (that’s an idea for a future post), however we will outline a recent experience we had at Hanover Park. Every so often, Amy likes to throw a dinner party featuring their wines out of several different Riedel glasses. To pair with each wine, she also prepared a small dish to enjoy along the wine. As always the food was fantastic and the wines paired perfectly. Below are the notes on the food dishes, notes on the specific glass we were using for that course, and our impressions of the wine from each specific glass. Many thanks to Amy, Michael, Emily, and Athena for helping to throw a wonderful event. 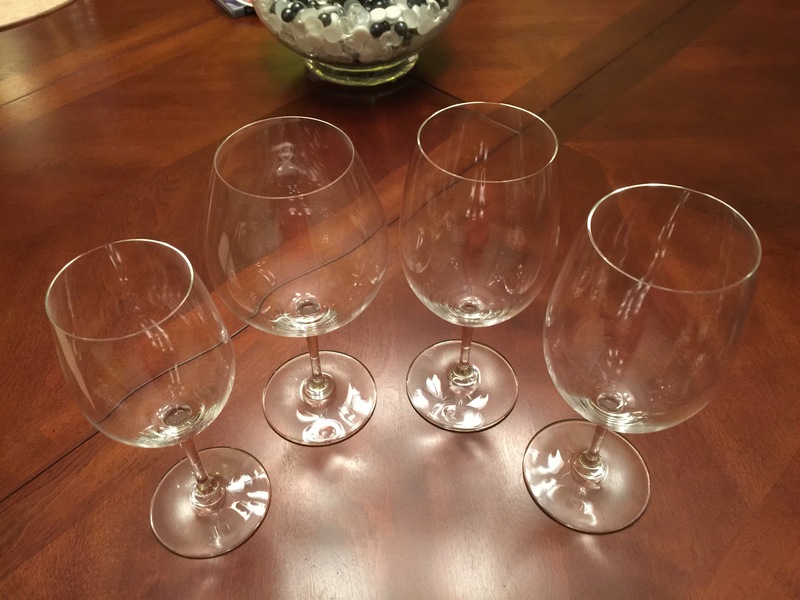 A sampling of Riedel glasses similar to those used at Hanover Park. The first course was roasted shrimp with a quinoa polenta dressed in a Chardonnay and onion sauce. The wine for this course was Viognier served in the Viognier glass. The wine itself was floral and nicely balanced moving into mellow mid-tones of Apple and Pear with a nice steely mineral finish. This paired nicely with the food as the fruitiness in the wine counterbalanced the garlic in the seafood. Course two was a baked ziti served with Chambourcin. The Chambourcin was served from two individual glasses, both of them Pinot Noir. The differences in the glasses was that one had a fluted top where is the other was more goblet shaped. Chambourcin always pairs nicely with tomato-based dishes as the acids in the tomato sauce mingle nicely with the soft essence on the wine. The wine out of each of the glasses was remarkably different. The nose on the wine from the fluted Pinot Noir glass was more vibrant and more robust, having a very earthy characteristic. The more goblet shaped glass had a muted nose, similar to the other one however a different as it highlighted more of the oak notes in the wine. The flavors of each of the wines were very similar, however the fluted glass was slightly better. It’s safe to say that the glass with the lip was our preference for this wine, however many people at the dinner preferred the goblet glass. Course number three was a fillet mignon with roasted red potatoes and a horseradish cream sauce. The wine served with this was the current vintage of 1897, their signature red blend. This wine was served out of the red wine glass (also suitable for any red Bordeaux). The wine is a blend of four different wines all from their 2009 harvest. The wine showed hints of plum with notes of dark currants on the nose, and a nice full body moving into a great lingering finish. The wine paired very nicely with this meal as the horseradish sauce danced around your tongue much like the spice on mid-palate of the wine. Course four was a light cheese plate of Manchego, a goat cheese, and a bleu cheese. To pair with the course we had the Mourvèdre served out of the Syrah glass. The wine itself was earthy and rustic with an inky texture that coated the tongue nicely. The structure of the wine was delicate, but not lacking in tannins. Of the three cheeses, the wine paired best with the Manchego, balancing the nutty characteristics of the cheese with the fruity tannins in the wine. The final course was not on the menu, so it was something of a bonus course. We finished the evening with a brownie, chocolate covered pretzels and a glass of Port Hanover served in their original tasting glasses. The Chambourcin base of the wine offered hints of coffee and hazelnuts. It made an excellent pair to the chocolate desserts as port and chocolate always go hand in hand.